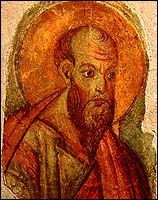 'Saint Paul,' Roma, 2nd half of 13th century (fresco fragments; 38 cm x 27 cm), Fabbrica of St. Peter's, Vatican Museum. "And I...... I'm desperate for you. And I...... I'm lost without you." Paul felt that longing, that yearning, too. In this eloquent passage we hear his heart's cry for God -- a prayer that I pray along with him. "I want to know Christ!" But how does this fit in the Letter to the Philippians? How does it come up? Paul is very concerned about some enemies who are trying to undermine the Gospel in Philippi. "1Finally, my brothers, rejoice in the Lord! It is no trouble for me to write the same things to you again, and it is a safeguard for you. Paul has apparently written them before on this issue, and is unapologetic about bringing the matter up again as a "safeguard" for them against false doctrine. Who are these "dogs" that he refers to? For Jews and other Middle Easterners, a dog wasn't "man's best friend," but an unclean scavenger. To call someone a "dog" was an insult and demonstrates Paul's disgust at the false teaching they were pressing upon the church. The "dogs" were what we call Judaizers. They were not only Jewish Christians who kept the Jewish law and worshipped Jesus as the Messiah. They were also quite vocal about their belief that a person couldn't become a Christian unless he became a Jew first -- and submit to circumcision as the ancient rite of admission into the Jewish community. Paul uses the phrase "mutilators of the flesh" to caricature their position on circumcision. Paul had met these people before during his earlier ministry in the Gentile city of Antioch. A watershed decision was made by the Jerusalem Council headed by James, (senior pastor of the Jerusalem Church, Jesus' brother, and author of the Letter of James), that was vital to the expansion of the Christian movement. Led by the Holy Spirit, the Council sent a circular letter to the churches to the effect that Gentile believers were not to be "burdened" with the requirement of circumcision (15:28-29). Worship by the Spirit of God. Jesus had told the Samaritan woman, "A time is coming and has now come when the true worshipers will worship the Father in spirit and truth, for they are the kind of worshipers the Father seeks" (John 4:21, 23). Spiritual worship is prayer, praise, and a life lived in dedication to God. Glory in Christ Jesus. "Glory" (NIV), "rejoice" (KJV), and "boast" (NRSV) is the Greek verb kauchaomai, "to take pride in something -- boast, glory, pride oneself, brag," perhaps best rendered here as "exult." We are the true people of God, says Paul, because we exult that the Messiah has come in Jesus. Put no confidence in the flesh. "Flesh" is the Greek noun sarx. It can be used in several senses, most commonly "physical matter that makes up the living bodies of humans and animals." But Paul often uses it in the sense of "sinful human nature that is rebellious against God." Here Paul probably has both senses of the word in mind, referring to both physical circumcision and sinful human nature as opposed to spiritual obedience to God. "Confidence in the flesh," according to Martin, is a way of expressing "the innate tendency on the part of the religious person to obtain a standing before God and to secure, by one's own effort, approval and acceptance with him." Circumcision -- "circumcised on the eighth day." He was no convert to Judaism who would have been circumcised later, but was born into it. Citizenship -- "of the people of Israel." He was not a Gentile proselyte, but a Jew. Genealogy -- "of the tribe of Benjamin." The tribe of Benjamin was small, but prominent in that the first king of Israel was from this tribe -- Saul, after whom Paul was named. The Benjaminites also prided themselves on holding the ancient territory surrounding the Holy City of Jerusalem. Family Heritage -- "a Hebrew of Hebrews." Unlike Jewish proselytes, he spoke Hebrew and Aramaic and was the son of a family that did so. Orthodoxy -- "in regard to the law, a Pharisee." He had been a strict Pharisee, educated at the feet of Gamaliel, a highly respected rabbi (Acts 5:34-40; 22:3). Zeal -- "as for zeal, persecuting the church." He had been so zealous for orthodox, Pharisaical Judaism that he had persecuted the church (Acts 9:1-2). Righteousness -- "as for legalistic righteousness, faultless." We'll consider the idea of righteousness (dikaiosynē) later in this passage. Here Paul is referring to a righteousness that is supposedly earned by obeying the commands of God as strictly interpreted by the Pharisees. Few could match such credentials -- certainly not the petty Judaizers who were troubling the Philippian church. Q1. (3:2-6) How does "confidence in the flesh" show up in your congregation? Have you ever struggled with it? French commentator Bonnard calls verses 4-7, "one of the most remarkable personal confessions which antiquity has bequeathed to us." You are hearing the core of the Apostle. By dissecting this confession, we risk reducing it to the sum of parts that by no means equals the impact of the whole passage. But let's see what Paul is saying. "Profit" (NIV) or "gain" (KJV, cf. NRSV) is the Greek noun kerdos, "that which is gained or earned, a gain, profit." "Loss," found in verses 7 and 8 is the Greek noun zēmia, "damage, disadvantage, loss, forfeit," with the implication of sustaining hardship or suffering. Why "loss"? Why isn't he merely neutral towards his religious credentials? First, because they are empty in themselves. They don't satisfy the heart. Second, the pride they represent stands in the way of grasping something much more valuable -- knowing Christ intimately. When you weigh the value of one vs. the other, his religious credentials tip the scale as "rubbish" (NIV, NRSV) or "dung" (KJV). The Greek noun skybalon means "dung, muck," both as excrement and food gone bad. To return to his former place is absolutely abhorrent to Paul. Does Paul have to reject his rich Jewish heritage to be a Christian? No. His letters are filled with appreciation for God's blessings to the Jews. What he rejects is the false assumption that one can earn righteous standing before God by one's credentials and a well-lived life. That he categorically rejects. But Paul has "lost all things" (3:8b). He has forfeited his promising career as a respected Jewish Rabbi to follow Jesus the Messiah. Paul, like each of us, had to choose his own path. Paul chose Christ, because he saw Christ's overwhelming worth when compared to his former path. Q2. (3:2-6) Why isn't Paul merely neutral about his religious pedigree? Why does he consider it loss, dung, an obstacle? In what way could your religious background be an impediment to your faith? What does it mean to "know Christ"? Paul's use of the term "knowledge" doesn't derive from the Greek mystery religions and philosophical schools that abounded in his day, but from the Hebrew scriptures. In the Old Testament, knowledge (Hebrew yāda`) denotes "living in a close relationship with something or somebody, such a relationship as to cause what may be called communion." The prophets look forward to that day of intimately knowing God. But this longing to know God can find fulfillment among Christians under the New Covenant because of the Holy Spirit who can reveal to us the very mind of Christ (1 Corinthians 2:16). Martin notes: "The Pauline expression 'to know Christ' is intimate, and glows with the warmth of a direct relationship; it may be therefore be taken as equivalent to 'fellowship with Christ,' to which Paul was introduced on the day of his conversion (cf. 2 Corinthians 4:6)." This is what it means to be "in Christ," a phrase found throughout Paul's writings. To be intimate with the Messiah is of "surpassing greatness" (NIV), "surpassing value" (NRSV), and "excellency" (KJV). This Greek participle of hyperechō means, "to surpass in quality or value -- be better than, surpass, excel." In our contemporary parlance we talk about, "chocolate to die for." But Paul meant it literally. To know Christ is worth giving up everything. What does it mean, "to be found in Christ"? I believe that he is referring to Judgment Day, the Day when all is revealed. On that Day Paul wants it to be discovered that he is "in Christ," knows Christ, trusts Christ, lives and dies for Christ. When all is said and done, will you be "found in Christ" on that Day? What is this righteousness? The Greek noun dikaiosynē has three basic meanings: (1) justice or fairness, (2) right standing, and (3) upright behavior, uprightness. The verb form of this word, dikaioō, can carry a similar range of meaning, but in this regard carries the idea, "to be acquitted, be pronounced and treated as righteous, be justified." Righteousness under law considers a person righteous because of his or her own upright behavior. Righteousness by faith, considers a person righteous because God has declared it so and as judge considers a person so. In brief, here's how it works. God agrees with our confession of sins that we are guilty and that there must be a penalty for sin. Once the penalty has been paid (crudely called in criminal law, "our debt to society"), then we are free. Yes, ex-cons, but free. Our penalty for rebellion and treason against the Most High God is death. That penalty has been paid by Jesus Christ on the cross. Thus God declares the penalty paid and that we are righteous, that is, in a right standing with God once more. This concept is difficult to grasp. It is hard to believe, since it is such amazing news. How can someone else take my sin? Who would do that? Don't I have to bear it and the consequences of it? How can this be? The core of the Christian faith is that we believe Jesus died for our sins on the cross and was raised from the dead for our salvation. Either it is true or it isn't. Either the crucifixion and resurrection are Christian myths or they actually happened in history and are spiritual facts of life. If the crucifixion and resurrection actually happened, and I believe they did, then Jesus, the Holy One, took all of the degradation of our unholiness upon himself, "the righteous for the unrighteous" (1 Peter 3:18), in order to remove our sin and guilt from us. (Also ponder Isaiah 53 to understand this better.) This is what Paul means when he refers in our passage to "the righteousness that comes from God and is by faith." But what does faith have to do with it? Though Christ has died for the sins of the whole world (John 1:29; 3:15-17; 1 Timothy 2:4, 6; 4:10; 1 John 2:22; 4:14), that salvation takes effect only for those who put their trust in him. Faith confirms what God has done and activates this salvation for oneself. These verses could be multiplied many times over in John 1:12; 5:24; 6:47; Romans 1:17; 4:5, 13; 9:30; 10:6; Galatians 2:16 and many others. Jesus died for your sins. You believe it to be true. You speak it with your mouth (that is, confess it). And you receive salvation and righteousness in return. Yes, your faith is weak when you are a new Christian. Sometimes you are like the man whose son was healed, who said, "I believe, help my unbelief" (Mark 9:24, NRSV). But you grow in understanding and faith and experience. Q3. (3:9) How does righteousness obtained through faith differ from righteousness obtained through law observance? How seriously does righteousness by law observance infect your congregation? Society's view of Christianity in general? Why is this concept of justification or righteousness by faith so difficult to grasp? Paul's salvation is secure in Christ. But his soul longs for an even greater intimacy with Jesus than he has already obtained. "Know" is the Greek verb ginōskō, "to arrive at a knowledge of someone or something -- know, know about, make acquaintance of." This knowledge is not esoteric enlightenment such as the mystery religions spoke about, but a growing personal relationship. The relationship begins when we first put our faith in Christ and grows over a lifetime. Sometimes our relationship seems stable. Sometimes it seems to wane. Occasionally, we might experience what St. John of the Cross described as "the dark night of the soul." But there are also times of rapid growth, of spiritual breakthroughs, of renewal and refreshing of the soul. Paul is crying out for more. He is hooked on God and only more of God can satisfy his soul. Paul also looks to Christ's death, that he might share that too, "becoming like him in his death." Whether Paul is speaking of spiritual death to his old life or literal martyrdom like Jesus himself it's not clear -- probably both. Finally, Paul looks forward to physical resurrection at Christ's return -- "and so, somehow, to attain to the resurrection from the dead." The phrase "and so, somehow," doesn't indicate doubt whether he will be raised from the dead, but uncertainty about his immediate future -- whether he will be released or executed. At Christ's coming we will experience the resurrection of our bodies. Whether we've been buried, cremated, buried at sea or still alive at Christ's appearing it doesn't matter. God's power will create for us new resurrection bodies -- no longer physical (though able to relate to physical world like Christ's resurrection body) but essentially spiritual (1 Corinthians 15:42-57). This doesn't mean just a "spiritual" resurrection, however, but a bodily resurrection. Christ's physical body was raised on the third day; the tomb was empty. The disciples could touch him, feel his hands and feet, and observe him eat food. The physical. But it was more. Jesus in his resurrection body entered locked rooms and ascended into heaven. We Christians are promised a body by God, who "will transform our lowly bodies so that they will be like his glorious body" (3:21). "When he appears, we shall be like him, for we shall see him as he is" (1 John 3:2). Do you long to know Jesus better -- really know him? That is my longing, too. Grant it, Lord Jesus. Q4. (3:8-10) What does it mean to "know" Christ? Does this mean to have faith? Or to have a personal relationship? Is it possible to have a personal relationship with Christ without faith? Is it possible to have faith without a personal relationship? Where are you on your quest to know Christ? Father, sometimes I sense that I am living far below your best for me. Far below that intimacy with you which is my privilege in Christ. Forgive me. Renew in my heart an intense longing for more, that I might seek you diligently and find in you my heart's desire. In Jesus' name, I pray. Amen. "Breathe," by Marie Barnett, ©1995 Mercy/Vineyard Publishing / ASCAP. "Safeguard" (NIV, NRSV) or "safe" (KJV) is the Greek noun asphalēs, which has the basic meaning of "firm, not shaky." Here it means "pertaining to being in someone's best interest, safe, secure" (BDAG 147; Thayer). Kauchaomai, BDAG 536, Martin 143. Kauchaomai is one of Paul's favorite words, used 35 times in his writings and only twice elsewhere in the New Testament. Richard J. Erickson, "Flesh," DPL 303-306. Martin 143. "put confidence" (NIV) in verse 3 and 4b is the Greek participle of the verb peithō, "to be so convinced that one puts confidence in something -- depend on, trust in." (BDAG 792). "Confidence" in verse 4a is the Greek noun pepoithēsis, "a state of certainty about something to the extent of placing reliance on -- trust, confidence" (BDAG 796). "Faultless" (NIV) or "blameless" (NRSV, KJV) is the Greek adjective amemptos, which we've seen before in 2:15. [With the a- prefix to show the negative, it comes from the verb memphomai, "to blame." P. Bonnard, L'Epître de Saint Paul aux Philippiens (Commentaire du Nouveau Testament, 1950), cited in Martin 144. Kerdos, BDAG 541. The word is also found in Philippians 1:21. The related verb kerdainō is found in verse 8, "to acquire by effort or investment, to gain" (BDAG 541). Zēmia, BDAG 427-428. The related verb zēmioō, "to experience the loss of something with the implication of undergoing hardship or suffering -- suffer damage or loss, forfeit, sustain injury" (BDAG 428). O'Brien 390. "Useless or undesirable material that is subject to disposal -- refuse, garbage." It was used in Greek in various senses -- excrement, manure, garbage, kitchen scraps" (BDAG 932). Spicq says about this verse, "to convey the crudity of the Greek... : 'It's all crap.'" T.C. Vriezen, An Outline of Old Testament Theology (Oxford, 1958), p. 129, cited by O'Brien 388. Greek noun gnōsis, "knowledge." It is used of (1) "comprehension or intellectual grasp of something" and (2) "the content of what is known." In the latter sense it can involve personal acquaintance with someone, in this case, Christ (BDAG 203-204). Hyperechō, BDAG 1033. Paul uses this word three times in Philippians: here, 2:3 and 3:8. Dikaioō, BADG 197. Leon Morris, The Apostolic Preaching of the Cross (Eerdmans, 1955, reprinted 1972), chapter 7, concludes that declaring someone righteous is the basic idea of dikaioō, not making someone righteous. Pistis, BDAG 818-819. In the phrase "by faith" (NIV, KJV) or "based on faith" (NRSV) we find the preposition epi, "upon." Depending on the context it can have a number of connotations. Here it is a "marker of basis for a state of being, action, or result -- on." This phrase can be translated, "on the basis of faith" (BDAG 364). This is described well by Richard J. Foster in his book, Prayer: Finding the Heart's True Home (HarperSanFrancisco, 1992). "Fellowship" (NIV, KJV) or "sharing" (NRSV) is the Greek noun koinōnia, which we've seen before in Philippians. Here it means, "participation, sharing in something" (BDAG 552-553). "Becoming like" (NIV, NRSV) or "being made conformable" (KJV) is the Greek verb symmorphizō, "to cause to be similar in form or style to something else, grant or invest with the same form as" (BDAG 958). The adjectival form symmorphos appears in 3:21 -- "pertaining to having a similar form, nature or style, similar in form." The Greek particle pōs, is used here as an adverb, a marker of undesignated means or manner, "somehow, in some way, perhaps" (BDAG 901). Here the uncertainty is whether he will come to the resurrection by martyrdom or at the return of Christ. He is uncertain about his death (Martin 153-154; O'Brien 411-413).